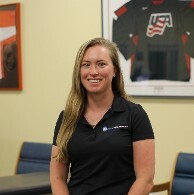 Katie McCarthy, PT, DPT graduated from Simmons College in Boston with a Bachelor's degree in Exercise Science in 2014 and a Doctorate in Physical Therapy in 2016. During her time at Simmons, Katie was captain of the women’s soccer team. As a student physical therapist, Katie held clinical affiliations in orthopedics and sports medicine, and in acute rehabilitation treating a variety of patients with neurological disorders and orthopedic polytraumas. Since then she has become a Certified Functional Strength Coach, working with athletes of all ages to alleviate pain and maximize performance. Her clinical approach and educational interests include concepts of postural movement dysfunction taught by the Postural Restoration Institute. Katie joined the Coastal Ortho team in 2016.